Backyard trampolines can entertain the whole family. Something about jumping high and doing acrobatics is just… fun, so both children and adults love them. Everyone who owns a trampoline will, at some point, notice it gets dirtier and dirtier with usage. Trampolines are also constantly exposed to the elements. So, between the Sun, rain, wind, and debris, trampoline mats get dirty. Furthermore, leaving your trampoline outside for the snowy, stormy winter sure as hell doesn’t help. A dirty trampoline mat can leave stains all over your body when you use it. Similarly, if you don’t maintain your trampoline, the strings can rust, and the mat can rip. In this article, we will give you the best advice for keeping your trampoline clean and safe after winter. But, before we even start, let’s talk about how you should take care of your trampoline during the winter. So, how to clean trampoline frame pads? How Do They Clean Trampoline Parks? Whether or not you should leave your trampoline out during the winter is a matter of personal choice and storage space. If you choose to leave it out, you should prepare the structure for the cold and wet winter. Firstly, make sure to remove the frame pads and store them inside so that they don’t get soaked from the rain or snow. Furthermore, the trampoline mat acts as a sieve and allows water to drain through. However, snow can build up on the mat and over-stretch the springs. Make sure to clean the snow with a broom after each storm. Also, trampoline covers are not recommended. Instead of protecting the mat, a cover locks in moisture, which can cause mildew and sagging. Another thing to take extra care about is wind. Trampolines can be a safety hazard in windy areas. So, it is important that you anchor ﻿the trampoline down properly. More about winterizing a trampoline here. Despite what people may think, using chemical agents is never a good thing when it comes to trampolines. Plain soap and water will be just enough. Basically, cleaning a trampoline is actually easy. It can also be a fun activity where even kids can participate. Most importantly, you get a perfect chance to examine every trampoline part for damage before cleaning it. Replacing faulty parts is crucial if you wish to avoid injuries while jumping. The mat is the heart of any trampoline. 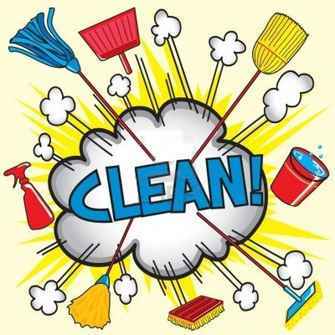 Therefore, it is important to know how to properly maintain and clean it. Firstly, use the broom to wipe any bigger chunks of dirt and leaves off the trampoline. Similarly, the broom can also loosen some dust if it got soaked into the mat. Some people skip this step thinking the hose will be enough. Trust us — sweeping the mat now will save you time later on. Secondly, hose the trampoline down with plain water. Make sure it’s completely soaked and start scrubbing with warm soapy water and a brush. We also recommend using a soft bristle brush, as it will provide effective cleaning without tearing or scratching the mat. After you’re finished scrubbing the trampoline, rinse off the soap using water. Make sure you get all of the soap off. Finally, use the towels to wipe the trampoline dry. Also, make sure to let it dry in the sun for a few hours before you let anyone use it. Even the smallest wet spot can cause a slip, and therefore an accident. Maintaining your mat is important. However, this doesn’t just mean keeping it clean. What you clean it with also matters. Trampoline mats are designed to withstand prolonged exposure to harsh weather and usage. This means they are made out of special durable materials. It is important to know which products you should and shouldn’t use for cleaning the mat, mainly because some chemicals can degrade the mat’s UV resistance and fabric. So, it is best to play it safe and use regular soap and water. Trampoline pads are almost as important as the mat itself, mainly because they protect the springs from rain and harsh weather. Unlike the mat, they are not elastic. Instead, they are like a cushion. While they mainly exist to protect the springs from the elements, they also protect you from the springs. Due to their similarities with the mat, the cleaning process is the same. Still, it is important to pay special attention to the area where the pad connects with the springs and the mat. This is where most of the dirt accumulates. Trampoline safety nets are very important accessories. They significantly reduce the chance of injury from falling off or hitting the trampoline frame. So, keeping your safety net in order can be the difference between a fun jump and a broken bone. You can always take the whole net down and clean it by hand, but there are easier ways. Investing in a car wash hose attachment is one of the easiest ways for cleaning the safety net. With it, you basically get a high-pressure water output from the hose. Keeping your trampo﻿﻿line springs clean is crucial for the lifespan of your trampoline. Since they’re made out of metal, they can rust and lose their elasticity. Also, rusty springs can squeak a lot! We don’t think anyone likes squeaky trampolines. Still, cleaning them is easy, just like with the mat. Use soapy water and a brush, but make sure to dry them afterward. More importantly, make sure to remove them from the mat if you are planning to spray rust protection on them. This is important because those chemicals can damage the mat and the pad. You can also do this without completely detaching the mat by doing it in stages. You should always check the trampoline springs before using the trampoline. If you see a rusty spring during an inspection, make sure to mark it using some tape. We have some easy ways of getting rid of rust and keeping your springs healthy! Firstly, combine half a cup of salt with juice from a couple of limes in a small bowl. You can also use lemons if you can’t find limes. Mix the contents of the bowl until you form a paste. Apply this paste on the rusty springs directly using a wooden tongue depressor and leave it on for two to three hours. Afterward, use an old toothbrush to scrub off the paste and the rust. Be sure to really scrub off everything. Rinse it down with a hose and make sure to dry it completely. This little recipe should help you with most rusty spots, although rust can penetrate deep inside the springs. In this case, you should just toss it in the trash and get a new one. Finally, you can apply petroleum jelly to the springs to keep them lubricated and prevent rust from forming again. Having your trampoline outside leaves it exposed to many things. One of the more annoying problems comes from tree sap. Many people are afraid to go after this sticky menace fully, as they don’t want to damage the mat. However, you shouldn’t worry because we have a few tips on how to clean sap off a trampoline. First of all, try using very hot water and a sponge. The hot water will soften up the sap, while you use the sponge to scrub it away. Don’t worry about damaging the mat, as mats are made out of really tough materials. Hopefully, this works for you. In case it didn’t work, and the sap is still there, our next step would be hand sanitizer. Yes, hand sanitizer. We know it sounds weird, but it works! Most importantly, it is available everywhere. The main ingredient of hand sanitizer is isopropyl alcohol (rubbing alcohol), which breaks down and removes the resin. We already mentioned why trampoline covers are not recommended during the winter. They trap moisture and lead to mold and mildew as a result. However, although it is a yucky sight, mold can be easily removed from your mat. While researching, we found that most people suggest using chemical agents such as bleach. However, we also found a safer way: pressure washers. Pressure washers can literally “blast away” the mold. Most importantly, you can adjust the pressure and not risk causing any damage to your trampoline. Hence, we believe you should try doing this first. Finally, if pressure washing doesn’t work, bleach can get rid of the mold. But, you should apply it very carefully. Using bleach is risky due to its corrosive nature. Bleach can even eat through steel if given enough time. So, make sure to thoroughly wash the mat with water after scrubbing off the mold. Leaving your trampoline outside during winter is okay, as long as you check it after every storm. It is important that you regularly clear the snow from the mat. Despite what many people think, snow is heavy when it accumulates. As a result, your trampoline springs might stretch too much and become useless. First of all, don’t use shovels and other sharp tools because they can damage your mat. It is best if you use a soft broom. Also, make sure to clear the snow from the inside out. We should avoid straining the springs more while cleaning. Water trampolines are a huge investment. So, we recommend a cautious and hands-on approach. You should focus on keeping the PVC fabric clean at all times. Dirt, mold, algae and other stains cause friction and scratches, which shorten the trampoline lifespan. These types of trampolines are very sensitive. One hole is enough to deflate the whole thing. You should never use petroleum-based cleaners and pressure washers. Instead, you should just use a mild soap. We also recommend fixing any problems, such as tears and holes, as soon as possible. Otherwise, they can “grow” and be a bigger nuisance. You can be pretty lax with your trampoline while cleaning it a few times a year to keep it in tip-top shape — trampoline parks can’t. Trampoline parks fall into the public domain of fun! As such, they are subject to regulations regarding public safety and hygiene. Seeing as how many people visit them daily and bring their own germs, this makes perfect sense. Workers have to clean trampoline parks daily, using special anti-bacterial sprays. Some parks also make their customers wear special jumping socks to reduce the risk of skin conditions. Another thing they have to pay attention to is dust and allergens. Many people suffer from allergies, most notably children. So, trampoline parks have to be vacuumed quite often, as trampolines are perfect at moving large amounts of air everywhere.